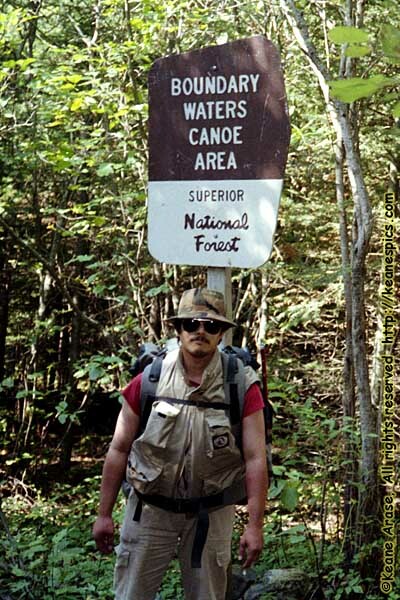 1990 was the year Ron and I decided it was time to do one of those BWCAW canoe trips. I mean, how can you say you were always going up to the BWCA, without taking a real canoe trip? Right? Well, here's the experience in a nutshell. You're going to take a trip, quite a few miles in length, where you have to carry your clothing, food, transportation and shelter. During those days, you are on your own. Rarely is there a way to bail out of the trip, so once you start, you're pretty much committed. I have to say it was an educational experience. It's the first time those little lines on the map met reality. It was a pretty rough experience, but at least I can say I did it. We outfitted and started from Clearwater Lake, then followed the border lakes for a few miles. Some of the portages are directly on the Canada-US border, and there are metal, official border markers along the trail. Not only can I say that I stood on four states at one time, but I can boast that I pee'd on two countries at the same time. Hey, do you think there are public bathrooms around here? Speaking of bathrooms, the National Forest Service provides primitive, unprotected uh... boxes. I took a couple of pictures. Over in Quetico, there are no official campsites, and you grab a shovel and find a log to sit on. Not sure which I'd prefer more. Or less. The Canadian border turns south as we followed it, then came back West and looped back into Clearwater. Relatively short portages, we gave ourselves four days to do it. It should have been 5. At least we had a week up at Seagull Lake to rest up afterwards. End Minnesota Arrowhead - Part 6 of 6.